Early records show that the discovery of gunpowder wasn’t a plan based on empirical knowledge. It was merely a coincidence and a result of consecutive mistakes made by Chinese alchemists. Widespread use didn’t come over night and progress was slow but it is safe to say that it certainly introduced some changes. Trying to find an elixir of immortality made the Chinese take the right path to the discovery of gunpowder. There are some clues which lead us to believe that even the Song dynasty knew about the formula. Most harmless application of gunpowder was in firecrackers, but the most important use was in the military. Gunpowder isn’t an explosive substance, rather a flammable one. So the control of incineration resulted in bombs, rockets and even flamethrowers. Once the force of these weapons was seen it was immediately obvious that it could be very useful for siege warfare. 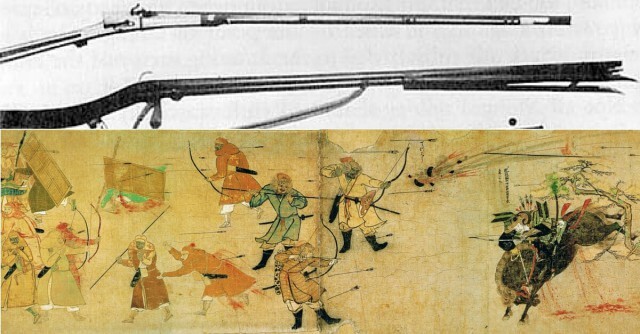 Fire-lance was the precursor to firearms and was widely used in Chinese military. Essentially, fire-lances were tubes, typically made out of bamboo, filled with gunpowder and were used to propel missiles. Sometimes they could be so big that they had to be carried on carriages. There are records of it being used in the siege of De’an against Jurchens in 1132. Early handguns had distinct parts, namely a barrel, a powder chamber and a socket for a handle at the rear end. The earliest know specimen of a handgun was excavated in Acheng district in July in 1970. It is made of bronze, 34 centimetres long, weighs 3.5 kilograms and has the aforementioned three distinct parts. Battle at Lake Poyang in 1363, one of the biggest naval battles in Chinese history, marked the Ming dynasty’s victory and it was largely due to use of gunpowder and firearms. It didn’t take too long for the Ming to make improvements to their army based on this new technology. Firearms Division was formed and it had a camp established near Nanjing. Their main task was to train men to fight effectively with firearms. The company was made out of 40 men with spears, 30 with bows, 20 with swords and finally 10 men with firearms. Later on, there was even a Weapon Bureau that was responsible for weapons and firearms manufacture. It’s an interesting notion that eunuchs didn’t have monopoly over this kind of production, even though they had one of the most important roles in Chinese history. Only Chinese work about firearms that survived to this day is Huolong shenqi zhenfa (eng. Fire Drake Manual) from the 15th century. It describes 38 different firearms (11 land weapons, 8 naval, 4 mines, 3 for defending camps, 3 for attacking caps, 5 for defending cities and 4 for attacking cities). Production of firearms outside the capital was very decentralized and relied heavily on individual regions. Each part of the empire had to produce a certain amount of equipment as a tax burden. Brigades also produced their own gear which testifies how big of an importance it had in the army. Private artisans that had the knowledge of production were highly regarded. Unfortunately, production methods were guarded secretively because of the nature of firearms that gave a huge advantage and shock-and-awe effect. This is why today we know more about horse breading in China, than the actual gunpowder production methods. These weapons did not mean that China would become an indestructible military force. On the contrary, many other political factors obstructed making this leap forward. Even though innovations were abundant in Chinese military, its flow halted and this kind of technology, despite initial attempts, spread to other parts of the world, most importantly to Europe.